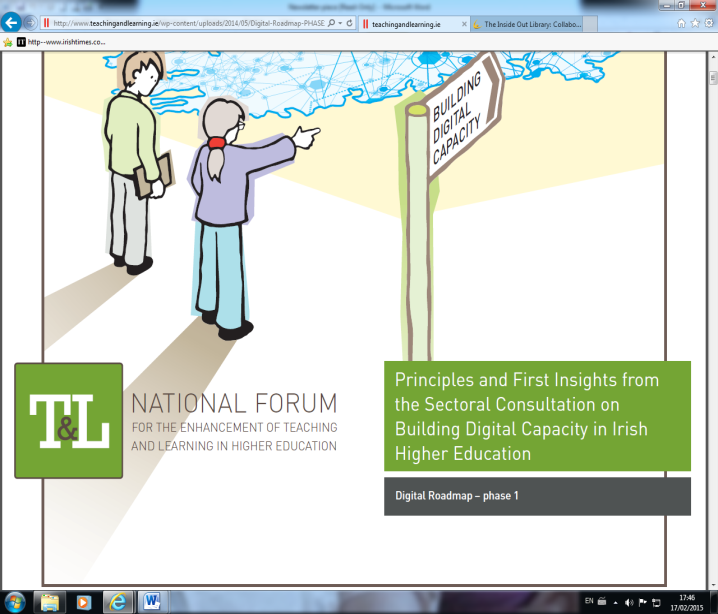 The Sectoral Consultation on Building Digital Capacity in Irish Higher Education: Digital Roadmap – Phase 1 by the National Forum for the Enhancement of Teaching and Learning. The above two quotes are taken from the report, The Sectoral Consultation on Building Digital Capacity in the Irish Landscape: Digital Roadmap - Phase 1 by the National Forum for the Enhancement of Teaching and Learning. They establish the tone of the report’s impressive vision and articulation of how a cohesive approach to digital innovation could revolutionise the teaching and learning experience in the higher education sector in Ireland. The Digital Roadmap exhorts higher education institutions in Ireland (public and private) to work together to exploit new and existing technologies for the benefit of learners, teachers and researchers. It also enumerates a number of recommendations that have emerged from a sectoral consultation which took place in April and May of 2014. The report concludes with an outline of a number of immediate actions that need to be taken to modernise use of technology in the sector. The report refers to a number of local examples of pedagogical innovation across disciplines and institutions all over Ireland which have facilitated online interactivity and collaboration such as Web 2.0 technologies and virtual learning environments. The Digital Roadmap has been informed by national and international research and by recent and current developments across the sector. It has sought inputs from academics, tutors, researchers, managers, librarians, technologists, students, leaders and policy makers, both in face-to-face sessions and through online contributions. The report identifies a number of shared values which must be embraced if the vision outlined in the Digital Roadmap is to be realised. These include a team approach to exploiting digital capacity; sharing and developing across institutions; linking teaching and research; parity of esteem for teaching and research and a commitment to including students as partners in education. The report reflects the goals of the Digital Agenda for Europe (DAE) and recommends that issues such as cybersecurity, personal privacy and identity, copyright, interoperability and standards, digital literacy, digital capacity in the context of student assessment, the principles of open education and open access (including institutional repositories) also be considered. The report also refers to the Government’s Principles on Open Access Policy Statement. Actionable first steps include: individual institutions developing a digital development strategy; a systematic review of technical infrastructure across the sector; the establishment of a collaborative approach to digital innovation across the sector; leveraging digital innovation to modernise student assessment; piloting a strategic approach (inter or intra institutional) to the incorporation of digital innovation into programme development; the adoption of open education principles by higher education institutions and the piloting of a collaborative and shared approach to academic and technical support. This Digital Roadmap is exemplary in terms of its vision and the wide reaching sectoral input and research/evidence base that informs it. The report encapsulates cutting edge educational ideals such as open education and open access. More inspiring still is the articulation of realistic and achievable actions/pilots for implementation on a collaborative basis with the goal of modernising the digital landscape in the Irish higher education sector within the context of constrained budgets. The National Forum for the Enhancement of Teaching and Learning has also allocated money via a research fund to support multi-institutional bids which enhance digital capacity in the sector.